Clean up yard and flower beds by removing any winter debris such as leaves and sticks. Make sure the areas where you have bulbous spring plants, such as tulips and daffodils, are cleared. Check over trees and shrubs for winter damage, prune off any broken or dead branches. Fruit trees - prune them early, before the buds begin to swell. Roses - (shrub, hybrid tea, and climbers) should be pruned back between 12-18 inches and remove any dead or damaged canes. Make your cuts at a 45° angle and above outward facing buds. Keep your eyes peeled for emerging perennials. Clean off dead leaves/flowers. Any perennials and ornamental grasses left standing all winter should be cut down to the ground, carefully, as not to harm any emerging new growth. Any heavily mulched perennials should have the mulch gently pulled away from the crown of the plant. Autumn clematis vines should be cut back to 12 inches. Add fertilizer to anything from the previous year, especially if the plant performed poorly or did not flower. Continue with yard clean-up as the weather begins to warm up. Cool season annuals can be planted – such as pansies and violas. Be prepared in case of a late frost. Any emerging growth will need to be protected. Continue with yard clean-up as needed. Watch for bulb foliage, make sure it is yellowed and withered before removing it. Have repellents handy if you have problems with deer, rabbits, and other pests, as they will attack tender new growth. When there is no longer a danger for frost, annuals and perennials can be planted. Give them a couple weeks before applying fertilizer. Plants that require stakes should have them on at 6 inches of growth. Prune back and shape early spring blooming trees and shrubs right after they bloom. This includes: lilac, forsythia, viburnum, magnolia, rhododendron and azalea. Roses - go ahead and fertilize when flower buds set. Watch for black spot as well as insect problems that might develop and have plenty of the correct type of pesticide available for them. Water garden plants can be installed when water temperatures reach 65 degrees. Plant any summer and/or fall blooming bulbs such as: cannas, caladium, gladioli, dahlias, Asiatic and Oriental lilies, calla lilies, tuberous begonias, and crocosmia. Watch your containers and planter boxes. When temperatures begin to rise or on very windy days, they will dry out quickly. Water as needed in accordance with the weather. Begin mulching. At least 2 inches makes a good layer and always keep mulch about 1 inch from the crown, stem, or center trunk of any plant. Mulch has many beneficial properties such as retaining moisture and soil temperature, controls weeds, and has aesthetic appeal. When peonies are done blooming, remove the spent blooms. Fertilizing annuals and perennials can be done regularly at the proper intervals. Water well after fertilizing so salts do not build up in the soil. Continue to watch your plants. Insects tend to go after succulent new material so have your pesticides ready. Avoid killing predatory insects, such as praying mantises or ladybugs. Roses - any hybrid tea varieties should be deadheaded, shrub roses and groundcover roses usually don't require it but all will benefit from removing spent blooms. Continue to monitor them for diseases and remove any infected leaves as you see them. Be prepared to treat the plant with a fungicide should it need it. Early flowering perennials can be dug up and divided after they are done blooming. Pinch back top growth on herbs to encourage branching and deter flowering. If you haven't begun caging your tomotoes and peppers, do so now. You can fertilize your hydrangeas with aluminum sulfate or use another acidifying agent to turn the blooms blue. In the first week, fall blooming perennials such as Chrysanthemums and Asters should be cut back to promote fall blooming. Continue to watch your plants watering needs. Always keep newly planted material watered evenly and thoroughly. Continue to cultivate and keep gardens free of weeds. Roses - watch for Japanese beetles and have the proper insecticide on hand. Continue to keep hybrid teas deadheaded. 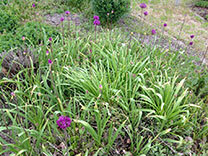 Early blooming perennials can be cut back to promote a second display of blooms. Keep daylilies deadheaded as they are done blooming. Other perennials, like butterfly bush, benefit from regular deadheading. Oriental poppies can be dug and divided. Make notes of where they are and strategically place them where other growing foliage can hide their dying, yellow leaves after they're done. Continue to pinch flowers off of herbs as they grow. Continue to watch all your plants for their watering needs. Newly planted trees, shrubs, and perennials will need it the most, especially if the month is hot and dry. Remove dead stalks from spent lilies. Daylilies can be dug up and divided at this time. Some reblooming varieties might not rebloom after transplant. Varieties that do not rebloom should have all dead stalks removed. Remove any yellow or dying foliage. Continue to deadhead other blooming perennials, this encourages the plant to put more energy into strengthening the roots. Strong roots ensure the plant's return. Not much pruning is advised for this month unless a shrub has just flowered and needs shaped. This is a good month to plant trees and shrubs. Lowering temperatures and decrease of daylight have put the tree in a good postition to avoid transplant shock. Water evenly and thoroughly, in accordance with the weather, until the ground freezes. Peonies can be dug up and divided. Remember when re-planting, buds (or eyes) should be no deeper than 2 inches below soil level. Daylilies can still be dug and divided also. Clean up dead or dying foliage from any perennials. When stems and foliage start losing their green color, perennials can be cut back. Refresh the color in your beds and containers with fall blooming annuals. This month is when spring bulbs like hyacinth, tulips, daffodills, and crocus are planted. Mulch the area thoroughly. Mark the areas where your bulbs are so they aren't disturbed during spring clean-up or planting. Summer bulbs should be dug up and stored properly according to specific instructions of the plant. Some particular bulbs want to be dug up after a frost, know your plant! Winterize your water features. Cover ponds and waterfalls with netting to avoid falling leaves. Remove pumps from the water and store them in a dry location. Any tropical plants should be discarded if not overwintered. Any container perennials should be cleaned up, cut back, and ready to be moved into a sheltered location to protect the roots for winter. Roses - Knock-Out and other shrub roses can be cut back to about 18 inches. Clean out any dead canes at this time also. Hybrid teas should be cut back to about knee height. Any tropical or house plants need to come inside when night temperatures consistently stay under 40 degrees. Some types will not tolerate under 50 degrees, know your plant! All containers should be emptied, cleaned out, and stored for the winter. All tools should be cleaned, sharpened, and stored for winter. Mulching is beneficial to protect new plantings and retain moisture. If weather is permitting, trees and shrubs can still be planted. Continue to water any trees or shrubs until ground freezes. Remember to disconnect any hoses from outdoor water faucets. Hoses should be emptied of water, coiled up, and stored for winter. Cut down to the ground all perennials that have turned brown.